Sometimes a color card just doesn’t cut it. I was having a hard time choosing the right Kona solids for an upcoming project. The undertones were making it hard for me to decide what I wanted to order. So… I just ordered a half yard of each grey on the card. Thanks, Fat Quarter Shop, for having everything I wanted! That left me with nine other fabrics, which I couldn’t resist grouping together in their own sub-bundles. It really surprised me that they all did not play better together; the different tones made for some surprising and clashing combinations. Today is the last day to enter to win a fat quarter bundle giveaway from the Fat Quarter Shop! The giveaway is open through Sunday (today!) at 11:59pm EST, so be sure to help me Welcome the Fat Quarter Shop as a Quilting Jetgirl sponsor and sign up for a chance to win! The giveaway is now closed. Congratulations to the winner, Minn R! The five you chose are perfect. I feel your pain, I would pick colors that I thought played well together, only to find it would change in daylight, vs incandescent, or cool light. Surprisingly hard to choose, especially Kona grays. I am glad they added more grays, their original selection of grays had very strong blue undertones. I didn’t know there were so many shades of gray!!! That first photo is drool worthy!! You are a girl after my own heart! I love that beautiful range of greys, and can’t wait to see your new projects, enjoy! Who would have thought grays would not play well together. The grouping of five looks great. Greys can be tricky,eh?! You’ve done a nice job of sorting them into groupings that work. Grays are hard to match as well as blues. My mother-in-law used to tell me that all greens went together – when decorating. I laugh now because she is right. Most greens do go well together but not grays or blues. You’re right about the color card. It would be nice to have larger swatches, I’m thinking credit card size, that are not glued down – it changes the way the fabric looks. And greys are so hard! I have one piece that looks perfectly grey until I put it with others and then it looks almost greenish. Weird! Looking forward to seeing what you do with these! I love the entire collection together, I think I would use it that way. This demonstrates a problem when a guild or group designates a block background as gray. You can end up with a hodgepodge of grays. If all of these grays were included, it would be fine. A recent group did this with a bizarre outcome, not good. Having larger pieces of the grays can be so helpful, it is sometimes really hard to see the undertones of the grays on those little color cards. I’m jealous of having all the greys to look at together! I love the bundle you picked, they look great together. Hopefully the yardage you order has the same undertones! Wish Kona was a little more consistent with their dye lots. I think that grey is the hardest fabric colour of all. From time to time I start again on my quest for the perfect one. Some are taupy, some are blueish, some are warmer, some are cooler. Ordering the stack is a great idea. Greys and neutrals are some of the hardest colors to coordinate because of the slight hue differences. Plus, our eyes are more sensitive to variances in achromatic colors than they are to similarly slight differences in brights. Good Morning Yvonne! Thanks for the information on Grey fabrics not coordinating well together. I really have not used a whole set of grey fabrics yet, but will keep this information written in my notebook for when I do. I am always excited to see your projects and the grey tones you have chosen are lovely! I did read your post and welcomed the Fat Quarter Shop as your new sponser; they are one of three quilt shops that I follow online. I have always received great service, choosing fabrics from all of the new choices and other deals is really hard to do…plus their tutorials and videos are always a bonus! Again, I am looking forward to seeing your new project…so have a fantastic creative day! 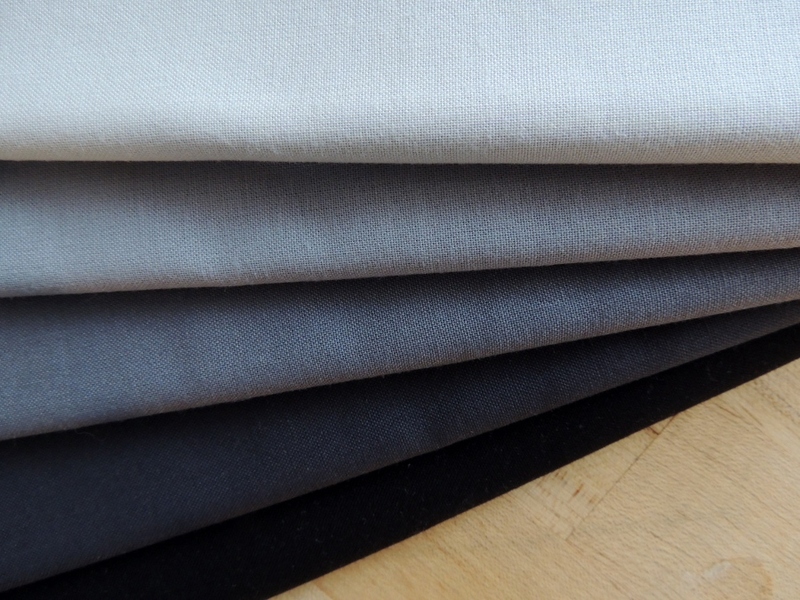 I do like the reasoning for buying additional fabric – and greys are really hard to coordinate – they lack colour which means that anything mixed in (brown, blue, green, yellow) affects the tone more than a richer palette. I think your five choices are gorgeous. Oh man, grays are tough but so worth it. Green grays, taupe-y grays, blue grays, purple grays, brown grays, warm grays, cool grays, I went through them all when deciding our exterior home paint. Your chosen group of 5 looks great. I have noticed that greys do not necessarily play well together. Found this out as have been collecting. Quite frustrating! Glad you now have the complete set of Kona greys to refer to. Will you record your “greys go together” somehow for future reference? I went through that same trouble for a grey progression this past spring. I used some other lines of solids to fill in a couple of the gaps. Have fun with yours! I’ve done the same thing before with solids when needing a select group of colors. I really wish some manufacturer would produce a complete gray scale of values from light to dark in both a warm and cool color range. It would make my fabric life easier. Buying larger pieces was a great idea. I think your groupings look good together. I’m looking forward to seeing your project. The grouping you put together seem to play well together. I love grays but they can be tricky. Paired with one set of fabrics they will actually look gray. Put them with something different and they magically turn purple or blue. Great selection! It always amazes me how a gray I’d supposed to be neutral or lack color, yet there are many colors in your selection. Good to find your transparency group and have all those others left for more projects. Happy valentine’s day to you and your valentine! I can’t wait to see what you do with all of these. 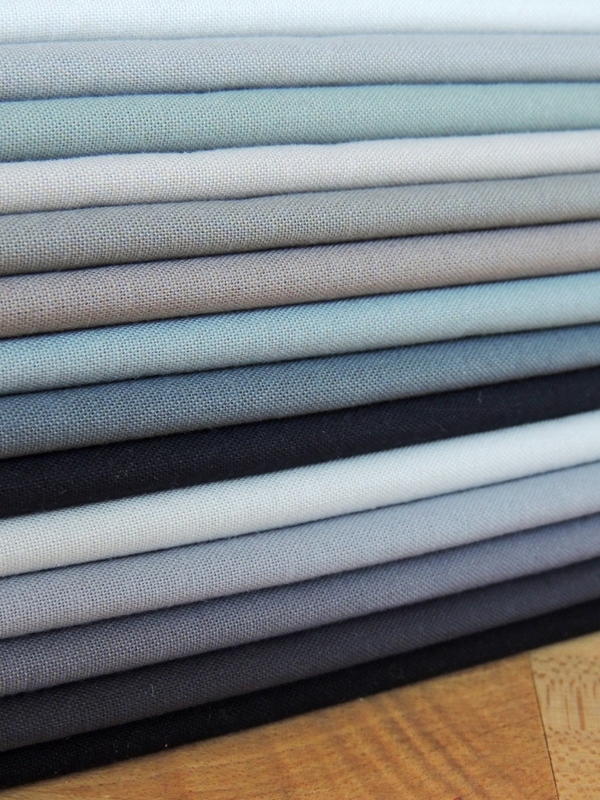 That’s one great looking pile ‘o fabric! yes, isn’t it interesting how they are all gray, but they don’t necessarily “go” together. But I love gray myself,so it’s kind of fun to have all those, I’m sure. Nice seeing all the rays together! And congrats to Minn! whoopsie, that should be grays! That’s a lot of grey! I’m guessing, though, that you won’t have any problems using it up. Who knew such subtle differences would make such a difference. Your project sounds very interesting, hope it’s coming on nicely. Your color selection is to be commended. It would be very difficult for most of us but after looking over the initial group, you chose very wisely. It must have taken a long while to come to your final conclusion. It’s gorgeous!